By spring, the new Dyckman Marina will offer some of the best sunset views overlooking the Palisades. What Henry Hudson saw on his journey up the Hudson River more than 400 years ago has mostly been lost. Settlement, population density, and industrialized development have largely altered the pristine state of the river’s banks. However, with views of the preserved section of the Palisades, the waterfront renewal project at Dyckman Marina will create an urban oasis that would make the river’s namesake proud. The Dyckman Marina was an inlet used by Lenape Indians until the Dyckman family settled there in the 18th century. 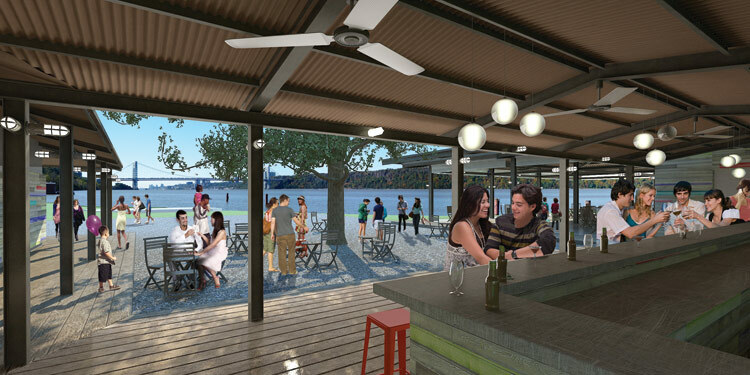 The new waterfront development project, which includes two new buildings housing a restaurant and cafe designed by architect Andrew Franz, is now under construction and set for completion in late spring. As part of Mayor Michael R. Bloomberg’s Waterfront Action Agenda, these new amenities will add a landmark destination along the Hudson River bike path and Manhattan Greenway. The marina can be accessed by watercraft, train, and bike. “Every other project on the waterfront feels very institutional,” said Franz, who said that site conditions at Dyckman Marina allow for a very “casual, coastal intervention.” Working with the developer Manhattan River Group, Franz designed open-air, steel I-beam structures that support Cor-ten roofs, choosing materials that take cues from the surroundings, which along with Palisades views, include at-grade Amtrak tracks and industrial warehouses. I-beams and cor-ten roofs shelter the crowd, taking industrial cues from the nearby amtrak line. Abutting the Dyckman Marina to the south is the project Lighthouse Link, a Parks Department revitalization plan for an uninviting strip of land between the Hudson River and Amtrak’s rails that stretches from Dyckman Avenue in northern Manhattan down to the George Washington Bridge. About $3.6 million has been provided for the removal of invasive species, new fencing along a portion of the Amtrak right-of-way, new pedestrian lighting, clearance of interesting viewpoints, and rehabilitation of the existing bike and pedestrian path. While restoring some prime viewpoints to New Jersey’s Palisades, by 2013 the Lighthouse Link project will also activate one of Manhattan’s largest still-remaining underdeveloped waterfront sites. At roughly 4,800 linear feet of waterfront, the greenway will provide visually dramatic access to the river. Franz is also optimistic about the potential of the rehabilitated edge. Aside from the hopes that the Dyckman Marina will be a popular local destination, Franz sees the marina as a trans-modal hub for day-trippers. “The goal is for people to come by watercraft, by train, from the community, and, for the serious rider, by bicycle,” Franz said.